This page was put together as a reference for a new found problem with the Canon 5D mark2 camera. It is mainly copy/paste from the dpreview forums where I first questioned the issue. The original post can be found here. 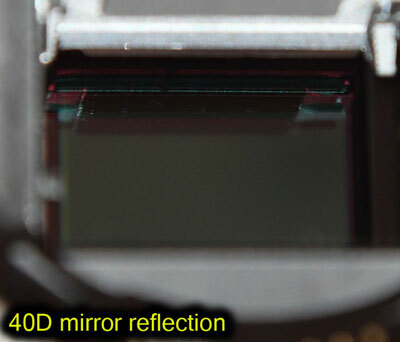 The 5DmkII will produce annoying flares because of a reflective back side of the mirror flap. I was playing about and got the shot bellow. Notice the strange flare at the bottom ? I reproduced the issue with EF24-105l at 3 different focal lengths, with EF50/1.4, EF70-300, Zeis Planar T* 50 . If I shoot the same scene in portrait or upside down I see no flare. All shots where taken with lens hoods on. Same shot with my 40D shows no such problems. To reproduce the problem I have to take any bright light/object on an overall dark scene a bit bellow the viewing area. How far bellow does not appear to be critical. This is not lens flare. Took two pictures (a lot more actually, 11 pairs to be precise, I just present one pair here). 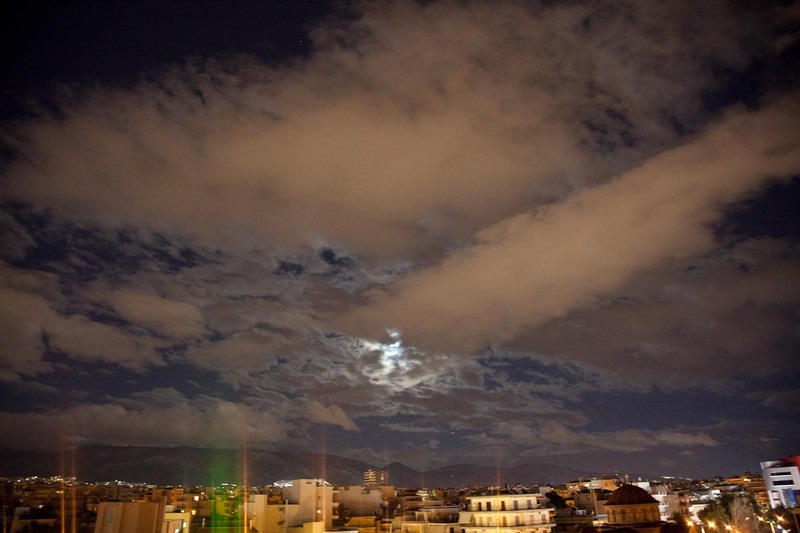 The second was with the camera rotated by 180 degrees. Bellow I post one strip of each one (Sorry for size, 1:1 pixel ratio). Manual focus with live view (focused only once per picture pair). Release with remote control during live view (see mirror lockup). Manual exposure (from exif: f4.5, 1/400, ISO 400, EF24-105L @ 105mm). Shot in Raw and processed in DPP with default settings. Exported to TIFF and cropped/combined in CS3. Exported to jpg with maximum quality. I had to crop a bit to the left/right to make the images best fit. Observe how the fairly bright sky affects the image quality when it is towards the bottom of the camera. There is no motion blur, just degradation of contrast. Check the letters on the solar collectors. (do not forget camera was in portrait orientation). The side that was closer to the bottom side of the camera suffers the most. The top strip has the effect more obvious because the sky at the right side was brighter. Also note that this is not extreme shooting conditions; the sky is within dynamic range without any highlights recovery. - I have confirmed that this is due to a very reflective back of the mirror flap. - It degrades image quality on every shot to a varying degree unless the surrouning of the subject is black (bottom side). - It is more obvious if there is backlight (even modest) behind the main subject and at the bottom of it. - At least one other Canon camera that I tried (40D) does not have it. Large prints (exchibition stands for me) reveal this issue. degrades performance of high quality expensive gear. It affects a "landscape camera" like 5DmkII in the worst possible way. and the high brightness of the snow (outside the frame) degrades contrast and color in the frame. Same goes for many scenarios like water highlights night lights, bright skies etc. Go buy the best sharpest glass, close the aperture down to the sweet spot, the loss is still there. This is another test I set up to verify that the problem comes from the mirror assembly. 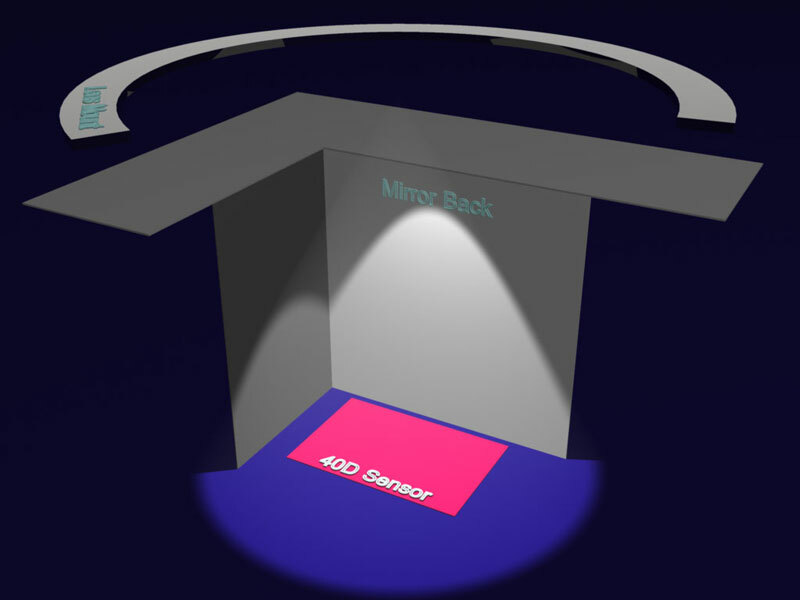 The idea is to light only one area of the mirror box at a time and check the reflection in the sensor. Since we have a different behavior for the top and bottom parts we should be able to see the difference. I did this test with 5DmkII (which did exhibit the problem) and 40D which did not. This further comparison could verify the whole theory. 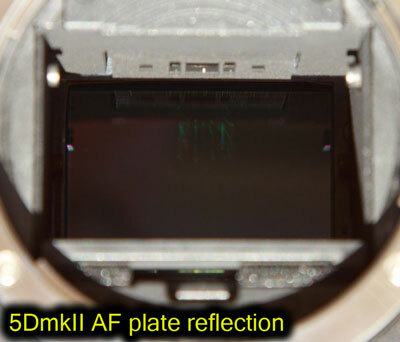 only the mirror backside or the bottom plate with the AF sensor. The reflection can be easily seen on all 4 but with different brightness on each shot. The ideal material would have a black hole where the reflection is. In our case the less bright the better. Note that the lit mirror back on the 5DmkII reflects so much light that almost blows the highlights. But most important check the reflection in the sensor area. I think the image speaks for itself and explains the whole phenomenon. - How much of the image circle hits the 40D mirror back ? - How much the 5DII back ? I did a very basic modeling of the camera mirror boxes and also a test model of the mirror's back face. The dimensions are as close as I could measure them. -The light source is positioned at the registration distance of the EF mount(44mm). 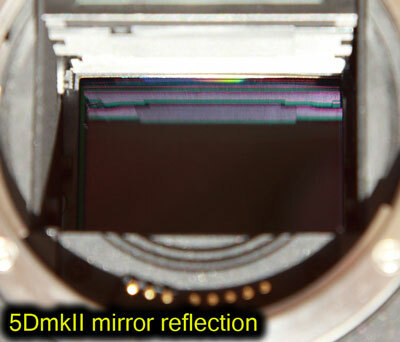 -It more closely resembles shooting with very small aperture. 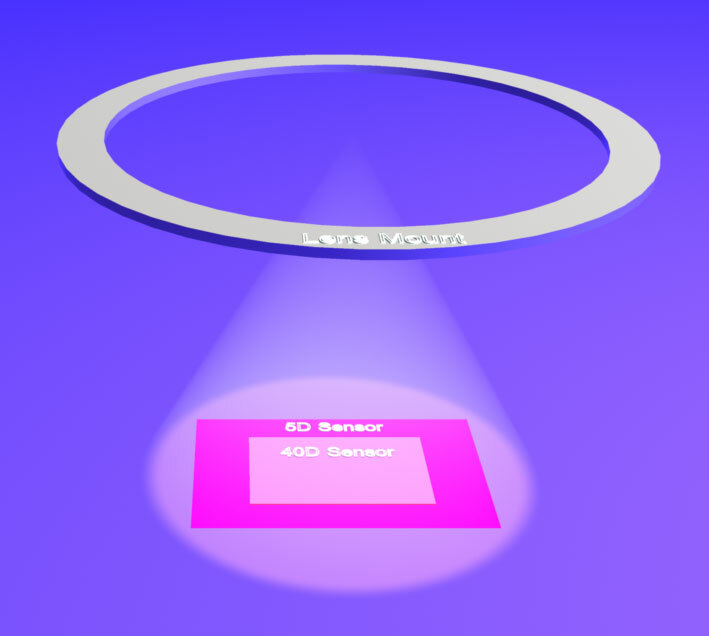 -The light projection was set to the minimum required to cover the FF size sensor. 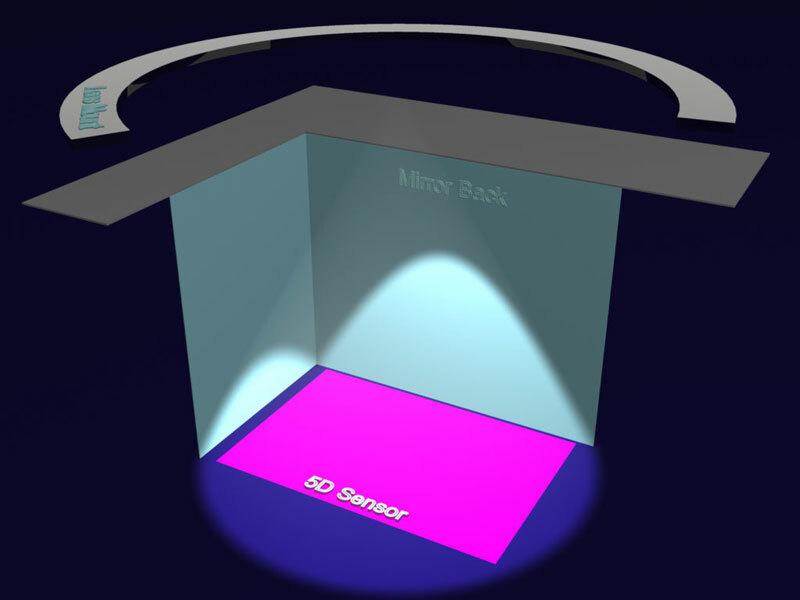 For the reflection model, I set three lights shooting very narrow beams on three surfaces. The first is a close approximation to the mirror's back housing with the distinctive horizontal grooves. The second is a flat surface. This should definitely produce an almost-circular reflection. The third is the same mirror back but rotated 90 degrees so the grooves are now vertical. 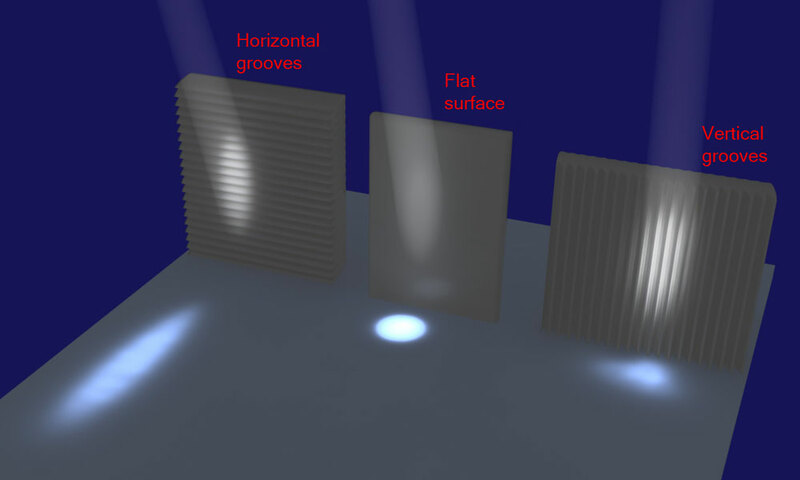 The extra two surfaces serve as a test/verification for the ray tracing accuracy. Please note that the bottom and right sides of the mirror box are not included so we can see "inside" easier. - The modeling is capable of resolving reflection, refraction, diffraction and caustics. 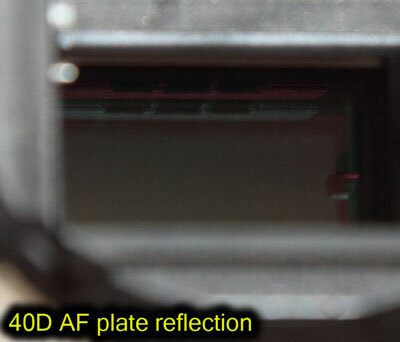 Recognize the shape of the reflection ? Observe how the flat surface produces a circular pattern. The vertical grooves produce a totally different pattern. The non uniformity is because the grooves are not symmetrical. It takes the horizontal grooves to get what we see in reality.